A couple of weeks ago I had the opportunity to go to one of the most distant – and difficult to get places – in the world: Tajikistan. After landing in Dushanbe – the capital – and staying there for a couple of days I headed out to the south (Farkhor) near the Afghan border. Farkhor is a city that has around 28,000 inhabitants and from the ‘outside’ it looks like any other poor town. Like many cities built during the Soviet era it is not very organic: its streets and housing blocks are organized and the outskirts are dominated by multistory prefab buildings. However when you start looking more in detail you realize that the city’s systems have completely collapsed. Households – that during Soviet times had water supply in their dwellings – are today getting their water through standpipes or using the irrigation canals. 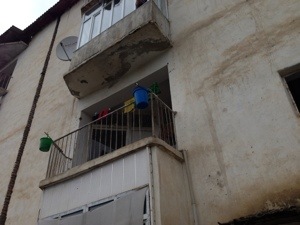 Some families use their balconies to collect rainwater as can be seen in the images below. While water supply seems to be one of the main priorities in these cities, one of my biggest shocks came from the precarious sanitary conditions that these families have today. 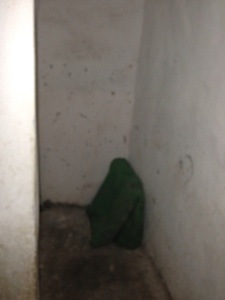 The image on the top left shows the place where toilets used to be in multistory buildings and the image on the top right shows today’s alternative for sanitation (Pit latrines). 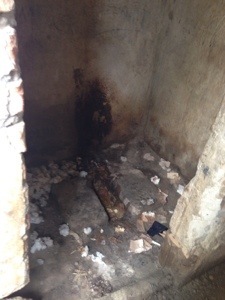 A couple of pit latrines serve around two or three buildings and are generally surrounded by illegal dumps as can be seen below. 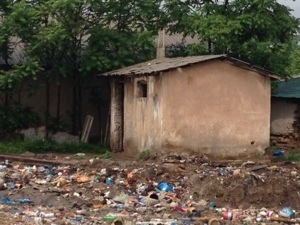 The deterioration of living conditions in many cities in Tajikistan following the fall of the Soviet Union has many causes* but reminds us that it is not only about achieving higher welfare levels but about achieving to maintain them. * One of the reasons for deteriorating water supply is that in the Soviet era water systems were over designed (to have 2-3 times the required capacity). Once market forces were put in place many of these systems were very expensive to operate and tariffs were not adjusted by central governments and municipalities. As a result utilities were not able to cover operating and maintenance costs.